We have included the famous Peanuts Cartoon character Snoopy to our arsenal of interesting collectibles, as the demand for some of his memorabilia is outstanding. Over the years Charles Schulz continued to expand Snoopy's role by creating over 100 alter-ego personalities including the World War 1 Flying Ace and of course Joe Cool. Below we have showcased what we feel are "Must Have" items featuring Snoopy collectors in what we feel are the most "prized" collectibles in each category. Click on the photos on the left of each category to see Snoopy collectibles for sale. Snoopy, whose fictional birthday has been established as October 4, made his first appearance in the strip of October 4, 1950, two days after the strip premiered. He was first identified by name on November 10. Schulz was originally going to call him "Sniffy" (as described in the 25th anniversary book), until he discovered that name was used in a different comic strip. He changed it to "Snoopy" after remembering that his late mother Dena Schulz had commented that if their family were ever to acquire a third dog, it should be called Snoopy, an affectionate term in Norwegian. Snoopy on his leash) and Patty without Charlie Brown, making Snoopy appear to belong to all of the neighborhood kids, similar to the dog Pete in the Our Gang comedies, who is everyone's dog. (Note: in this era, it was common for dogs to roam their local area and congregate with local children, and then return to their respective homes). Later, Charlie Brown states that his parents bought Snoopy for him at the Daisy Hill Puppy Farm, after another boy had dumped sand on him while playing in a sandbox. Snoopy was a silent character for the first two years of his existence, but on May 27, 1952 he verbalized his thoughts to readers for the first time in a thought balloon; Schulz would utilize this device for nearly all of the character's appearances in the strip thereafter. At first, Snoopy acted as a normal dog, and would only think in simple one-word phrases (such as "FOOD! 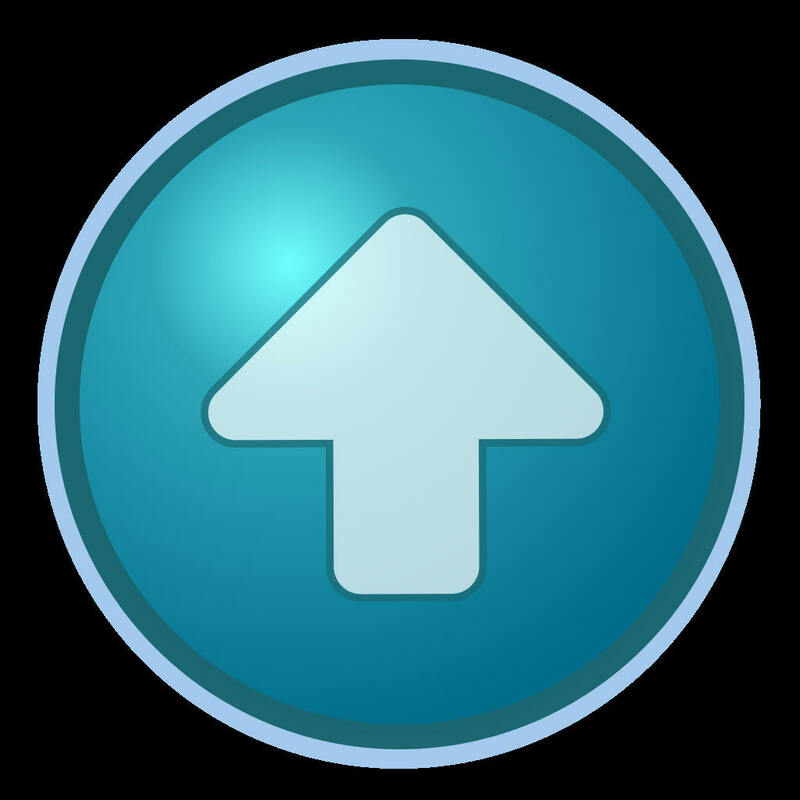 "), but then became more articulate. In addition to Snoopy's ability to "speak" his thoughts to the reader, many of the human characters in Peanuts have the uncanny knack of reading his thoughts and responding to them. In the animated Peanuts films and television specials, Snoopy's thoughts are not verbalized; his moods are instead conveyed through growls, sobs, laughter, monosyllabic utterances such as "bleah," "hey," etc., as well as through pantomime. The only exceptions are in the animated adaptations of You're a Good Man, Charlie Brown and Snoopy!!! The Musical, in which Snoopy's thoughts are verbalized through voice overs (by Robert Towers and Cam Clarke, respectively). Animation producer Bill Meléndez voiced both Snoopy and (eventually) Woodstock in numerous television specials from 1965 to 2006. In Peanuts Motion Comics, Snoopy's thoughts appear onscreen as text in thought bubbles, without voice. Joe Cool made an unofficial debut in the Peanuts comic strip on June 13, 1970, when Snoopy was drawn with sunglasses for the first time. He was officially named “Joe Cool” nearly a year later on May 27, 1971. Since then he appeared regularly in the strip especially throughout the 1970s. Snoopy as "Flying Ace "
On Sunday, October 10, 1965, Snoopy’s imaginary life soared to new heights as his doghouse was transformed into a Sopwith Camel airplane, and he took on the nefarious Red Baron in the skies over Europe. Schulz, who served as a sergeant in the army, had always wanted to draw adventure comic strips, but he was told to stick with what he did best—funny kids. After 15 years, Schulz finally had an opportunity to create his adventure action hero: Snoopy, the World War I Flying Ace. The popularity of Snoopy has risen to such a high level, that even the highly prized Steiff Company began producing exclusive Snoopy pieces for collectors. 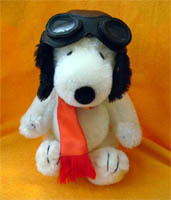 We have for your consideration some of the most popular Steiff Snoopy pieces created. 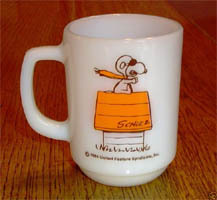 Fire King Coffee Cups with Snoopy have really become popular with collectors, with the famous "Orange" Curse You Red Baron cup being the trophy of them all. Click on the cup to the left to see them all.